Homemade salted herring is extremely tasty and useful. Salt herring is quite simple. It does not need special ingredients and skills. And herring, salted at home, much tastier than the one that they sell in the stores. Recipes for salting herring a lot, but there is one time-tested easiest and fastest way to salt the fish. Need to buy in shop of a large herring, preferably with a whole skin, and without the rusty spots. If herring frozen, pre-thaw. Rinse the fish and give some water to drain out. Herring can be run immediately to remove the head and entrails. But it is better to salt the whole, and to clean afterwards. To make the brine. To add salt about 1 kg of herring, you will need 1.5 liters of brine. You need to take 1.5 liters of water and put to boil. Add 5 tablespoons with slide salt and 1 tablespoon sugar. If you wish to brine, you can add Bay leaf, peppercorns, cloves and 1 teaspoon of vinegar. Boiled the brine should be cooled to room temperature. Herring folded into the container. Will fit three-liter jar, enamel pot or small basin. If you use a pot or basin, then you will need weight to hold the fish. Otherwise it will float. Pour the cooked herring brine and place in a cool place. Herring will be ready in about 48 hours. Get salted and very tasty. 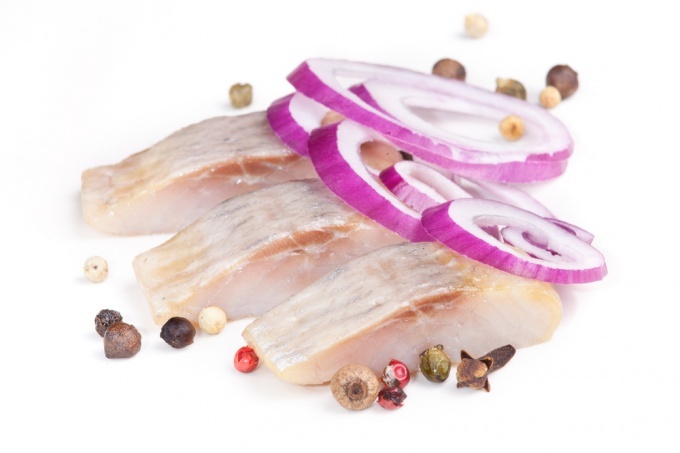 Herring - a source of beneficial to our body protein rich in amino acids. In addition, this fish is high content of vitamins A, D and E, and we need macro - and micronutrients. Additionally, the herring – a source of iodine. 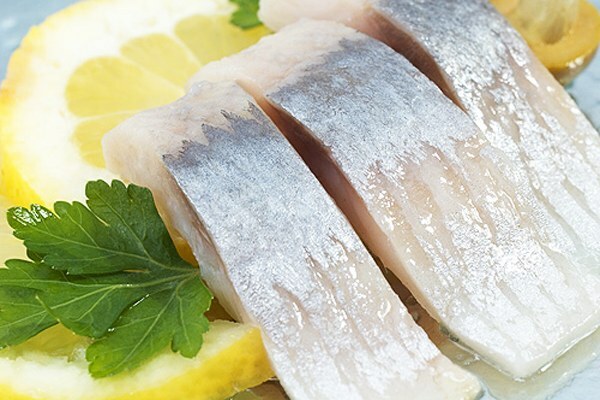 Tender and tasty herring fillets in vinegar marinade is one of the most popular snacks. The marinade is prepared very quickly and due to the small pieces of fillet quickly impregnated with the marinade. The sharpness of the marinade will give the sugar and black pepper. Rinse the herring under running cold water. Put the fish on some paper towels. Remove the tail, all fins and head. Slit the belly and clean out the insides. Rinse the fish again and change towels, throwing the entrails and the fins. Make a cut along the spine of the fish and, starting at the top of the carcass, skin. Then, from the side of the ridge with a knife, separate the fillet from the bones. Onions clean and cut into thin rings. Make a marinade. Cream the butter and add the vinegar, a pinch of sugar and pepper. All whisk well with a whisk. Place chicken and onion in marinade and carefully, but being careful not to damage the meat, stir. 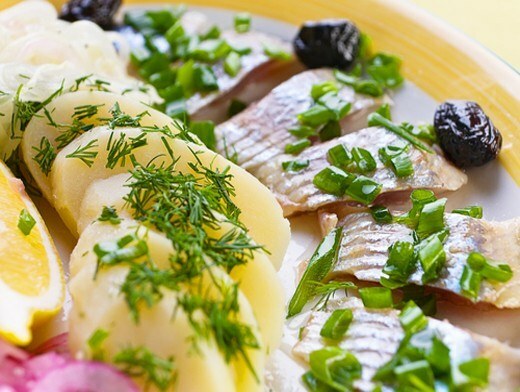 Herring, inexpensive and tasty fish. On our table it is present consistently. In addition to good taste, herring has useful properties. Because it contains about 20% protein that is easily digested. Choosing the herring, take the larger. Usually it is fatter, tastier. And bones of such fish easier to remove. Starting the cooking, cut the fish's head with a sharp knife. Remove the fins. Cutting the belly of a herring, clean the insides thoroughly. Don't forget to remove the black film on the inner walls. Along the ridge of fish make a neat cut. Then remove the skin. Divide the fish into two halves and remove the bone. Rinse the herring under running cold water and cut into small pieces. Onions clean. Wash it and cut into half rings. At the bottom of the dish place the onion and pour it vinegar. After 5-7 minutes add in the fish. 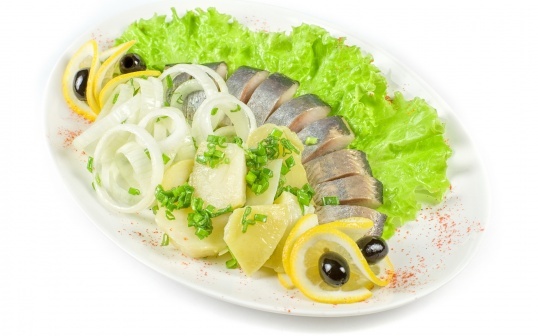 Pour the herring with onions and vinegar with vegetable oil. Use unrefined sunflower oil. Then the dish will turn out flavorful. All stir again. Herring with vinegar and oil ready. This dish can be prepared for the future. Place it in a glass jar, refrigerate, adding on top a little vegetable oil. As such, the herring can be stored for 3-4 days. Herring salted in brine or dry Ambassador. Often field salted fish smoked or pickled. If the brine for herring add the mustard, pepper and other spices, you get many favorite herring of spiced salting. - 1 liter of filtered water. In this recipe, water can be replaced with dry red or white wine. So the fish need the unusual but very pleasant taste. Mix the water with salt. Stir until then, until all the salt dissolved without a trace and get a saturated solution. Herring have – clean, cut the gills and remove the insides and place in a glass or earthenware bowl and pour brine. Soak the fish for 3-4 hours, then rinse under cold, running water and dry, if you want to smoke or pickle herring, or keep in a brine in the fridge. In a glass baking dish, pour a thick layer of salt. Fish carcass wash and dry, have to fillet, fold so that the flesh was inside and the skin outside and put on salt. On top sprinkle another thick layer of coarse salt, wrap the form with cling film and place on top of the cargo. Salt herring for 2-3 days, then soak for 2-3 hours in fresh water, rinse and marinate, smoke or store in the vegetable oil. Salted herring can be stored for 4-5 months. - 1 teaspoon of coriander seeds. For pickling, try to choose large, fat herring with a wide back. Prepare the brine. Pour into a small pan with water, add salt and pepper, allspice, coriander, cloves and Bay leaf. Bring to a boil, stirring until salt and sugar is completely dissolved. Remove from heat and cool spicy brine. Put the herring in a glass or earthenware container, cover with brine. It should cover the fish completely. Cover with clingfilm. Salting should last at least 12-15 hours. - 1 teaspoon of mustard seeds. - 1 head red onion. Slice the lemon, and an onion half-rings. Rinse the herring. Pour the vinegar into a saucepan, add the sugar, allspice and black pepper, Bay leaf and garlic. Bring to a boil and cool. Put the herring in a jar, alternating with onion and lemon slices, pour in marinade, cover and refrigerate at least 12 hours. Such herring may be stored in the refrigerator for months. Salted herring is a favorite Russian snack, a real festive table decoration, a recipe which came to us from Holland. In the fifteenth century ordinary fisherman Willem Bockelson decided to turn bitter and malosedobnaya fish into a delicious snack. The secret was very simple – they only needed to remove the gills (because they were concentrated bitterness), and salt. After this open fisherman has received at its home of the monument of love and glory. For salting it is very important to choose the right herring, because the freshness and quality of fish will depend on the tenderness and flavor of the finished snacks. Of course, the best herring for salting – fresh, but it's hardly available to all. Therefore, most will have to settle for frozen fish. Pay close attention to the Pacific or Atlantic herring. With caution should buy sea herring (Baltic), in that fish may be elevated levels of toxins, heavy metals and other harmful substances. The fish should be bright and bulging eyes, natural color tight fins and Gill covers. Avoid buying dented, yellowed and lost a large number of scales of fish. - 10-15 peas of fragrant black pepper. Take a three-liter glass jar and wash thoroughly, pour it table salt, sugar and everything necessary for pickling spices. You can buy in the store special ready mix for salting herring. Pour all ingredients pre-boiled warm water, mix with spoon, salt and sugar are completely dissolved. Place into the prepared brine whole unskinned carcasses of the herring. To fish it was easy to fit in the jar, you can advance slightly thawed, it should be done in natural conditions, in any case not in the water. Submerge fish completely in the brine, close the jar with a plastic cap with holes. Leave fish at room temperature for five hours, then refrigerate for two days. The passage of time comes the most difficult moment is cutting homemade herring. Carefully remove the fish from the skin, remove the head, all fins, tail and entrails. Separate the fillet from the bones, cut into portioned slices, place on a platter. Garnish with thinly sliced rings of onions and pour the fragrant oil. This appetizer is eaten very quickly, especially boiled potatoes. It is not necessary to separate the fillet, you can just remove the head of the herring, remove the viscera and cut into portions pieces.